Real Food can be summed up in one simple statement. There's a lot of conflicting information about food out there, and your head is probably spinning as you try to sort through it all. Just focus on nutrient-dense foods. 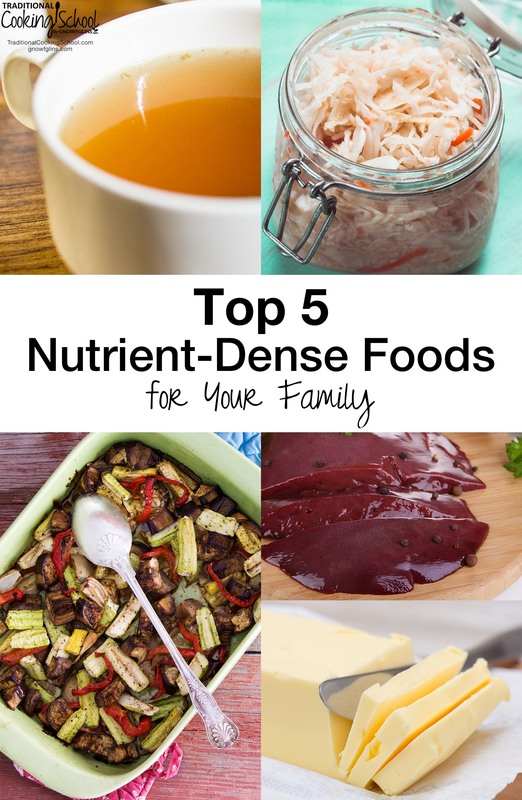 You can eat these top 5 nutrient-dense foods without sticking a label on your lifestyle — you don't have to follow any special diets to include them in your meals. Perhaps the simplest, most traditional, most prized nutrient-rich food in the arsenal is the humble bone broth. Made from scraps of cartilage, tendons, and bones, broth is full of good stuff: collagen, gelatin, minerals, and amino acids. Bone broth delivers a lot of nutrition for very little money. It helps heal and seal the gut, strengthens the bones, reduces joint pain and inflammation, and promotes healthy hair and nail growth. It is also healing to the adrenal glands and thyroid. Bone broth is one of the most frugal of foods you can eat, too — essentially water and scraps that would otherwise be thrown away or fed to the dog. At Traditional Cooking School, we favor the low-maintenance method of perpetual stock made in the crock pot. You can also learn how to make bone broth (or stock) in our Fundamentals eCourse. 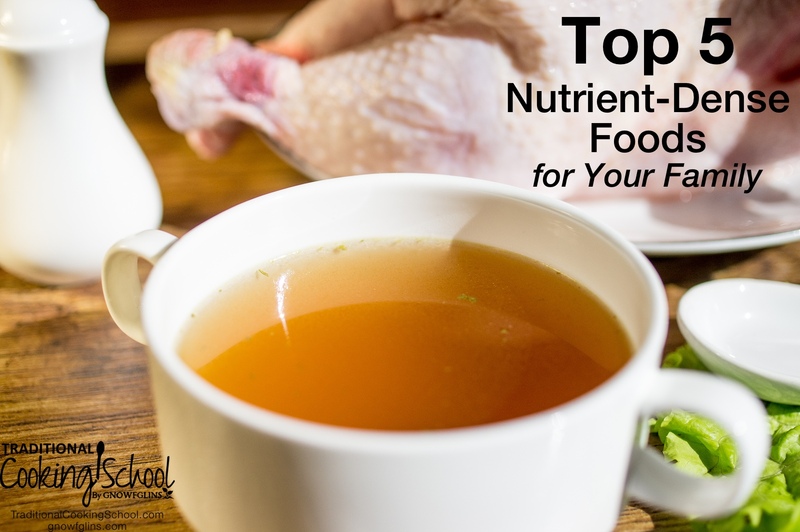 While drinking broth straight from a mug is pretty simple and straightforward, we know there are those of you (or your children) who may not prefer this, so here are 8 ways to get that stock in without drinking it straight. Or you can make your bone broth more exciting by using one of these methods! Action step: Begin making bone broth and finding ways to incorporate it into your family's meals. 80% of your immune system lives in your small intestine. It is a delicate balance of beneficial and harmful bacteria and yeasts. These organisms are responsible for nearly every function in your body! It stands to reason, then, that keeping the number of beneficial organisms up and the number of harmful organisms down makes a lot of sense. 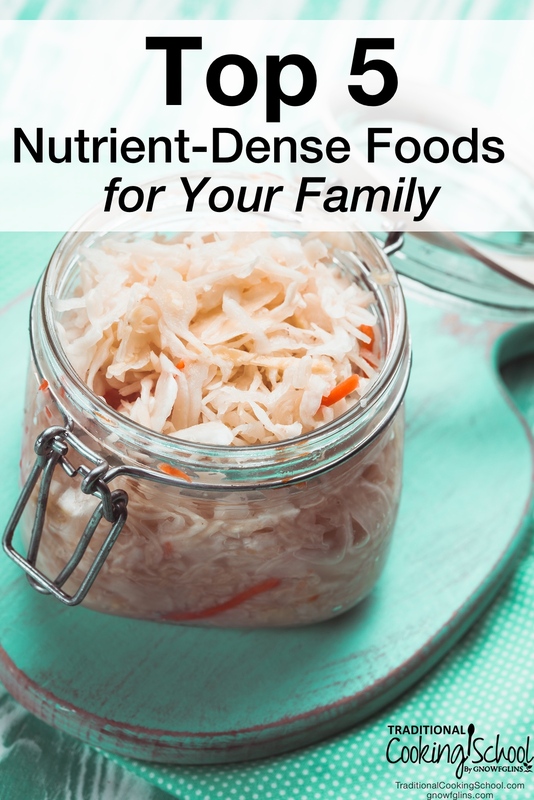 Fermented foods, rich in beneficial organisms, of course! You can (and should) take probiotic supplements, but not at the expense of denying your body probiotic-rich foods. Your body needs BOTH. ALL Real Food diets and healing protocols — Paleo, GAPS, SCD, Traditional, Primal, and AIP — emphasize the importance of eating fermented foods. No nutrient-dense lifestyle is complete without them! Almost all meat in the United States comes from concentrated animal feeding operations (CAFOs). Animals raised CAFOs live in the most deplorable conditions — those conditions do not come without a price on our health. Because they are in such close quarters with other animals, and often without fresh air, clean water, and sunshine, these animals are more prone to sickness. Their food is laced with antibiotics — which then end up in the meat. Numerous studies are showing that the same antibiotics used to keep confined animals “unsick” is making humans more sick — because these antibiotics are affecting the delicate flora in our guts (source). As if the use of antibiotics wasn't enough to turn you off of conventionally raised animal products, consider the diet of these poor animals*. In a CAFO, cows are fed an obscure concoction of chemically laced corn and other grains, by-products from the production of ethanol and high-fructose corn syrup, and silage (source). It isn't as hard as it used to be to find local ranchers who can provide you with far superior beef, pork, and chicken. They often give bulk discounts if you purchase one-quarter, one-half, or one whole animal. If you need more convincing, check out 7 Reasons Why You Should Start Eating Liver Today + How To Eat It Without Gagging. Action step: Cheap meat may seem like a deal, but it's really not. Check EatWild.com and LocalHarvest.org to find farmers of pastured animals near you. As you find sources for pastured meat, begin incorporating it into your family's diet. While raw vegetables can be beneficial, they are often difficult to digest, especially for those with poor digestion and/or leaky gut. So most of the time, reserve raw veggies for fermenting. Roasting, boiling, or steaming vegetables softens their fibers, making their vital nutrients more available for our bodies. Also, always cook green leafy veggies — such as kale, chard, and spinach — before eating. You can disguise certain veggies in a blended soup for picky eaters. Action step: Include a rainbow of veggies in your family's diet. Red: red bell peppers, red potatoes, radishes, rhubarb, red chiles, red onion, tomatoes, and radicchio. Orange: butternut and acorn squash, sweet potatoes, orange bell peppers, carrots, turmeric, and pumpkin. Yellow: spaghetti squash, yellow beets, rutabaga, yellow tomatoes, and summer squash. Green: lettuces, kale, cabbage, broccoli, cucumbers, spinach, chard, celery, peas, green beans, Brussels sprouts, arugula, zucchini, jalepenos, green olives, and bok choy. Purple: eggplant, red cabbage, purple potatoes, purple carrots, purple peppers, and black olives. White: mushrooms, turnips, kohlrabi, cauliflower, garlic, jicama, onions, parsnips, potatoes, and ginger. When we use the term “traditional”, we mean foods that our ancestors have eaten for thousands of years — not foods that have been developed in a chemistry lab in the last 100 years. Our ancestors would not recognize vegetable oil or margarine or Crisco as foods. The fats they ate didn't require huge factories and expensive equipment to process. 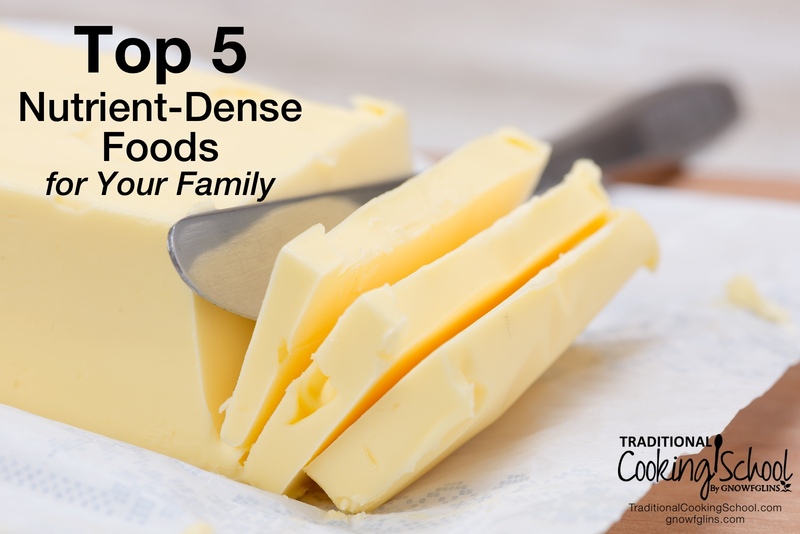 Rather, traditional fats require very little processing and can be made right in your kitchen. 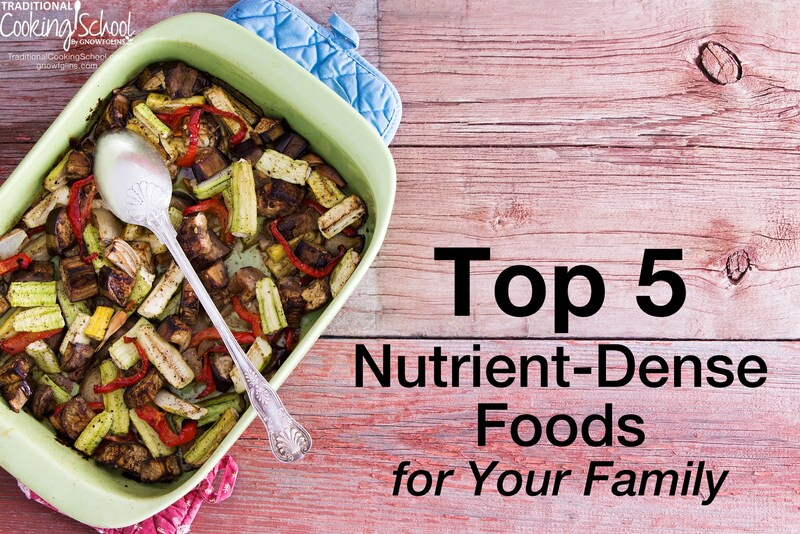 Even if you're not making them, however, they are a huge component in a nutrient-dense diet. What are these healthy, traditional fats? Action step: Toss out any vegetable oils or margarine you may have. Replace these unhealthy fats with healthy, traditional fats. See how simple Real Food is? 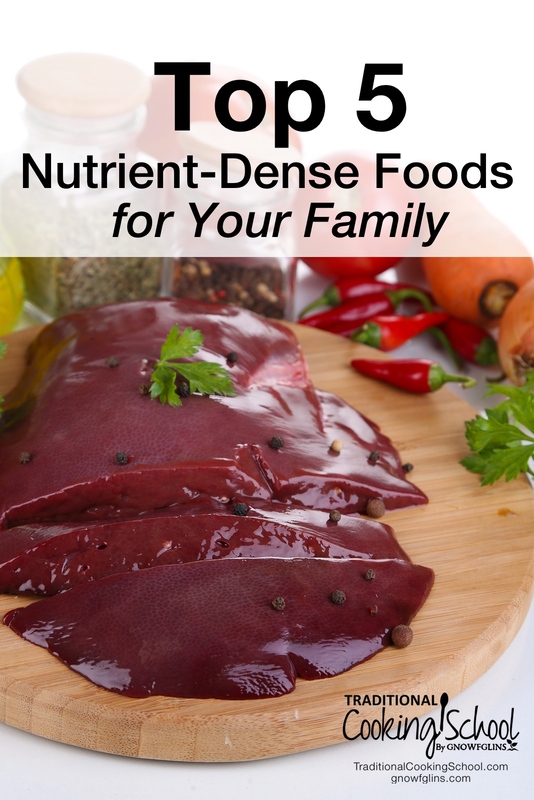 Include these foods in your family's diet liberally, and you're well on your way to a lifetime of better health! What are your favorite nutrient-dense foods and what easy tips can you share for including them in your lifestyle? Thank you for encouraging people to eat more healthy food and for linking to my website as a resource for information about raising livestock. However, I have to disagree with your statements about our meats being laced with chemicals and antibiotics. That is a gross misrepresentation of what we feed cattle and the safety of our food supply. We take several steps to make sure the animals we raise turn into safe foods for people around the globe to eat. Farmers and ranchers take great care in raising their animals to be healthy and use tools like antibiotics judiciously and work to be better stewards of our resources. If people would like to seek out alternative meat sources, that’s a personal choice, but belief shouldn’t be used to demote the food families, like my own, are raising for conventional sources. Ryan, thank you so much for your comment and for coming across in such a kind, respectful tone. 🙂 I understand your perspective and truly appreciate all farmers and ranchers who take great care with their livestock. However, the scope of this website is to encourage and educated our readers to seek out food sources that are raised in their natural environment with access to their natural food sources. Research on both sides (conventional and unconventional) has shown that antibiotics and growth hormones are found in meat products from animals who are given these products. And research has also shown that the meat from grass-fed/pastured animals is higher in beneficial vitamins and nutrients. Our hope is that by presenting the facts — that CAFO-raised meats are indeed given antibiotics and growth hormones and are fed GMO corn and soy products, silage, and other by-products — our readers can make educated decisions for themselves. Thank you for engaging the discussion! I believe the comment from Traditional Cooking School was regarding CFAO horrid conditions and championing traditional methods that benefit humans and animals alike. We love when we can raise our own beef, poultry, and goats, and butcher our own raised or hunted animals, then can all the broth and most or all of the meat. Then when we want to eat it doesn’t take long to open a few cans and cook some veggies in it, add spices and herbs as you prefer and there is your delicious soup. Better yet to have canned veggies on hand. Happy eating! I was so close! I guessed them all right beside fats, I was thinking properly prepared grains instead. But fat is SO important. I cannot believe I missed it, lol.